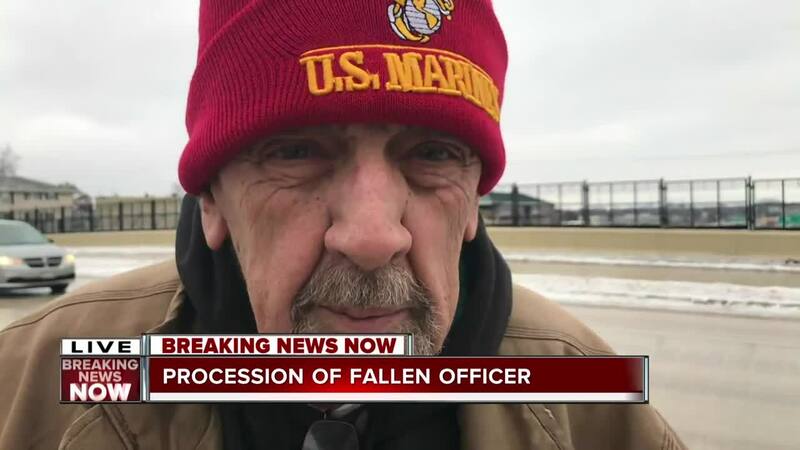 Milwaukee citizen came out to honor the 35-year-old fallen officer that was killed Wednesday morning. MILWAUKEE — A 35-year-old Milwaukee Police Department officer was shot and killed Wednesday morning on Milwaukee's south side, marking the third death in the police department in the last eight months. Gov. Tony Evers responded to this tragedy on Twitter. Kathy and I send our thoughts and sincere sympathy to the family and friends of the officer whose life was lost, the entire Milwaukee Police Department, and the people of Milwaukee as they mourn this tragedy. This loss is a reminder that men and women put their lives on the line every day to protect our citizens and communities in Wisconsin. We are grateful for their bravery and call to service. The shooting took place near 12th and Dakota, and the officer immediately was transported to Froedert Hospital, where he was pronounced dead. The officer was killed by a 26-year-old suspect.